Bronwen, Rachael, Angie-May and Sophie talk us through how their wear it pink days are going from strength to strength. Oh, how fast the year has flown by! 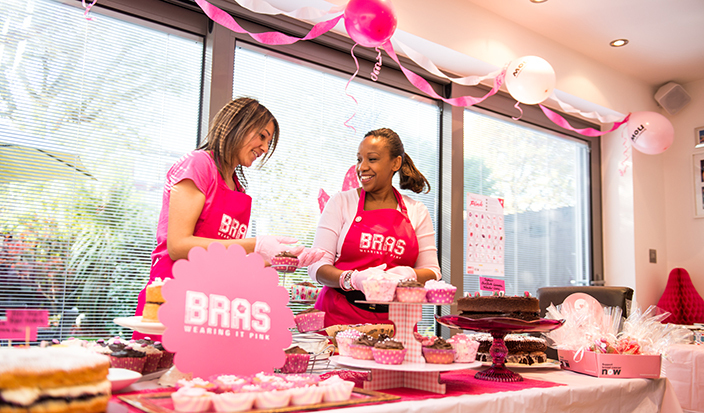 It seems like only yesterday we held our third wear it pink fundraising bake off and raised a grand total of £1,877.00 for Breast Cancer Now. Again, sticking to our pledge to make each bake off bigger and better, this year we threw down the gauntlet once more. We challenged ourselves and all those behind us to put the money where it really counts. Like all of our bake offs in the past, the preparation starts long before the actual event. Of course this year, we had the extra pressure of how we were going to beat our rather impressive total of last year’s bake off. It would be no easy feat. Could we do it? Would we do it? Even we didn’t know how we could raise more money! This year we really went to town, even branding ourselves the Barnet B.R.A.S after our initials (Bronwen, Rachael, Angie-May and Sophie). This meant not only did we decide to make invitations, collect gifts, buy ingredients, bake countless cakes, decorate and sell them, but one of us had to stay up all night printing aprons. Hats off to Sophie, she did a fabulous job! Preparation really is the key, so we got to work setting up our JustGiving page for people to donate online if they couldn’t make the event. This year we also set up a Facebook page, which allowed us to post photographs of all the local business owners who kindly donated gifts for our raffle prizes. We could also update everyone on how much we had raised so far. All the gifts and cake boxes had been collected from local businesses, which was a great start. Next, to bake! There wasn’t a clear work surface left in any of our kitchens and the bags of sugar, self-raising flour, eggs, and tubs of butter, cream, and icing sugar stretched as far as the eye could see. The air was filled with the sweet aroma of vanilla essence, and the sound of mixers could be heard throughout our neighbourhood. 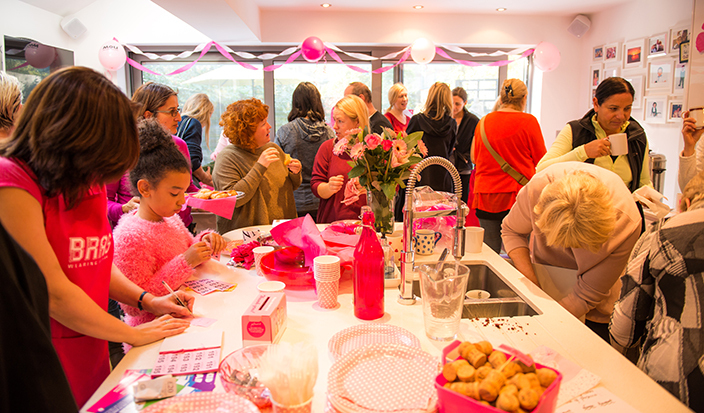 Finally on the morning of November 11th, in a seriously pink kitchen, wearing seriously pink aprons adorned with our new logo, we opened the doors on our fourth annual bake off. As usual, the locals didn’t disappoint, they arrived in their droves to support us: to buy cake; drink tea; eat cookies; and catch up with their friends, all while donating to this very worthy cause. We were so pleased to see that our crowd had grown this year, due to word of mouth and quite possibly the tastiest cakes in Barnet. 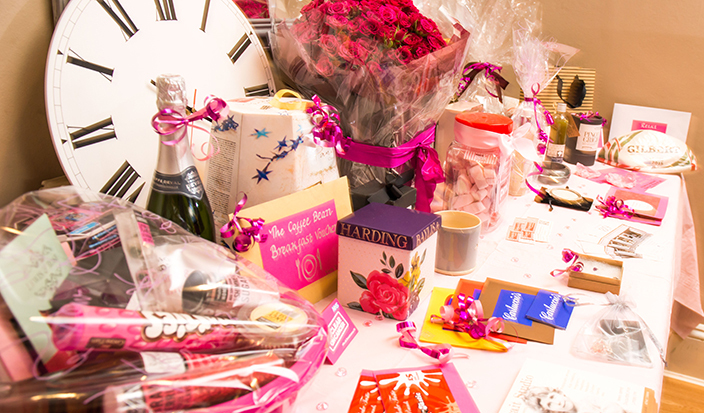 We held a raffle with fabulous prizes including reflexology sessions, restaurant & smoothie vouchers, breakfast for two, luxury candles, manicures, toys and the list goes on and on. Our sweepstake, in which you could win a wonderful prize of a selection of pink baking goods and a bottle of pink bubbles, how apt… Also back by popular demand our “guess the number of corks”, where you guess how many corks are in the bowl to win a fitting prize. As people mingled with friends and family, the whole event was beautifully captured by our wonderful professional photographer Diego Bonfanti who generously donated his time, and what a truly wonderful job he did. It was a truly amazing morning and everyone involved had a great deal of fun. As it’s not often you get to spend time with that many friends all at once, while doing something so beneficial for a lot of people. After two hours of serving and boxing up cakes, making teas and coffees and drawing raffle tickets, it’s always a surprise that the whole thing has ended so quickly. Another year, another successful bake off over. As the last people left, carrying an abundance of cake boxes in different sizes under their arms, we closed the door on bake off number four and collapsed into our chairs for a well-earned cup of tea! Well, with aprons off, we had to get counting. The total raised on the day itself was an impressive £914.00! Of course, this was not quite the dizzy heights of the year before. but didn’t include any of the online donation or the donations from the local schools who got right behind the cause. We were nothing short of ecstatic when we realised that not only had we broken last year’s total, it is safe to say we smashed it! Yes, we raised a fabulous grand total of £3,122.64. Once again, it goes without saying that we would like to extend our thanks to all the local businesses who donate fabulous gifts year after year to help us out. The wonderful people of Barnet and those beyond, who donated through just giving, Foulds local pre-school, Foulds school staff, Dwight School London and The Holmewood School. This really is a joint effort and we couldn’t do it without them. 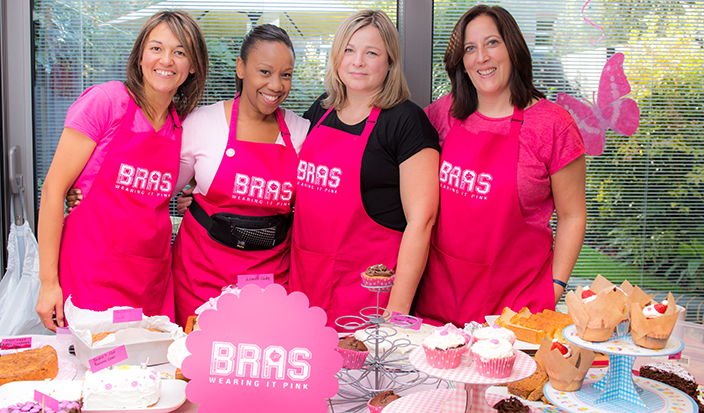 As for the Barnet B.R.A.S, we will endeavour to keep wearing it pink year after year and will honour our pledge to go bigger and better each year. 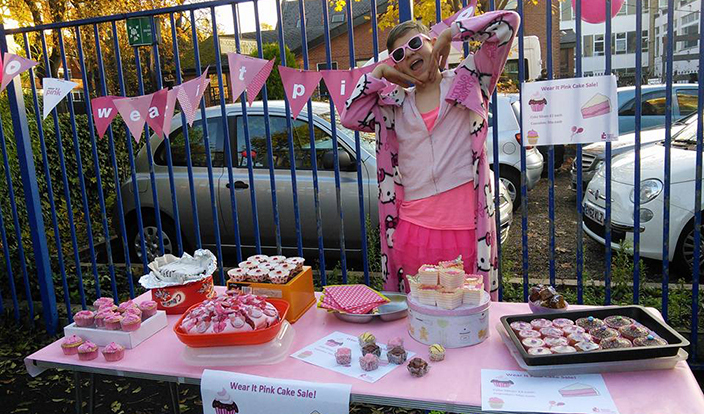 As for the total for next years bake off; just like that flour we put into our cakes we hope it keeps on rising…. If you want to find out more about the lead up to and the events of our wear it pink day, visit our Facebook page at Barnet bras or go to our JustGiving page (it’s never too late to donate! ).